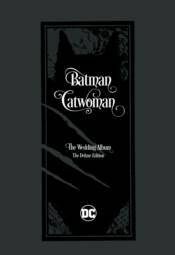 The historic wedding of Batman and Catwoman is commemorated in this must-have collector's item, featuring the historic wedding issue and the tales leading up to the big day, plus behind-the-scenes design sketches and variant covers. Collects BATMAN #24, 44 and 50, plus the retailer variant covers from issue #50, wedding dress designs by Jo�lle Jones, the script to issue #44 and more. BATMAN & THE OUTSIDERS VOL.1: CHRYSALIS BATMAN / FLASH: THE BUTTON DELUXE HARDCOVER (REBIRTH) INTERNATIONAL ED.